It was interesting to observe the shifts happening in Malaysia since Pakatan Harapan was seen to be leading the polls. Before Mahathir even put ink to paper to confirm his Prime Ministership, the end of a 61-year rule already had profound impacts that spelled out big changes—if not by the ruling party, then within the fabric of our society. The tone of media coverage shifted, and suddenly many Malaysians felt emboldened to speak out from a different perspective than we’re used to. Here is a list of social media posts that would not have been possible even just a week ago. 1. Rosmah’s daughter alleges that her mother was abusive, among other things. Datin Azrene is more famously known as the wife of celebrity chef Dato’ Fazley Yaakob. Almost immediately after Najib was ousted, Azrene came out with a shocking Instagram post alleging Rosmah Mansor of quite a few transgressions—from mental and physical abuse, backroom deals, misuse of power on both the part of Najib and Rosmah, to accusations that the former premier attempted to bring her family down. Fazrene has come out to corroborate his wife’s story. 2. Keow Wee Loong’s photos of the former opposition members. Early in this Malaysian photographer’s career, he shot portraits for Nurul Izzah Anwar. Over the past few months, he had also been involved in campaign shootings for certain Pakatan Harapan candidates because he finds the underdog stories from the former opposition more interesting. To him, they are snapshots of history. He has recently released his work documenting the former opposition following their tide-turning win in GE14. 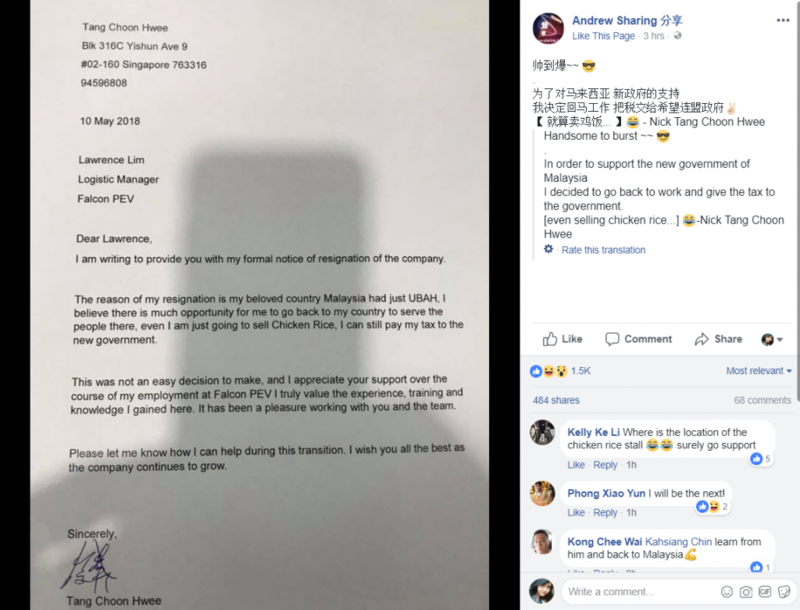 According to Wee Loong, his recent work drew the anger of UMNO “cybertroopers”—which led to death threats against him and his family, and fake posts under his name that led to more death threats. 3. This Malaysian is moving back to Malaysia following the change. For a number of Malaysians who may have moved out of the country due to disillusionment with the previous government, a rising patriotic spirit may bring these individuals back to Malaysia. That being said, those who are disillusioned by Pakatan Harapan as the ruling government may choose to leave in the place of those returning. 4. 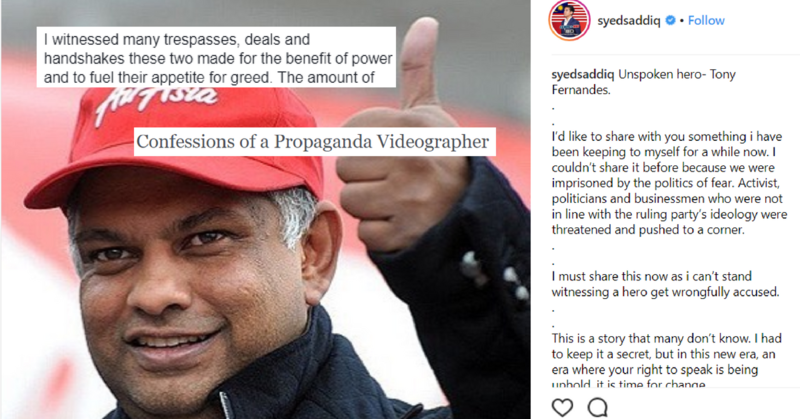 Syed Saddiq shares a defense of Tony Fernandes. Tony Fernandes publicly threw his support behind Barisan Nasional and Najib prior to the votes getting cast. The mogul suffered huge backlash from Pakatan Harapan supporters online following his endorsement. Now that Barisan Nasional is no longer on top, Syed Saddiq came out with a statement defending Tony to Pakatan supporters—he claims that Tony was backed into a corner and was pushed to throw his public support behind the previous government following some past actions. 5. A Malaysian calling his own work “propaganda videos” for the “People In Power”. A “propaganda videographer” released a longform confession and recount of the videos he made for the “People In Power”. In his account, he recalled one Malaysian in a polo shirt who genuinely believed in the People In Power, but was still disappointed with certain aspects of their governance over his kampung. 6. For some Malaysians, they can unironically declare their love for the Prime Minister. On social media, many netizens use the term “I love my PM” as an ironic jab. But since Pakatan Harapan won, many segments of this populace were able to declare their love for today’s government unironically, that they’re pro-government and that they’re proud of their country. This was expressed in a Twitter thread started by TheMingThing. Okay guys lets play a game on this thread. I’ll start the ball rolling. I REALLY LOVE AND RESPECT MY PM. Here are 3 predictions of how the economy will be affected now that Pakatan Harapan has gained power.